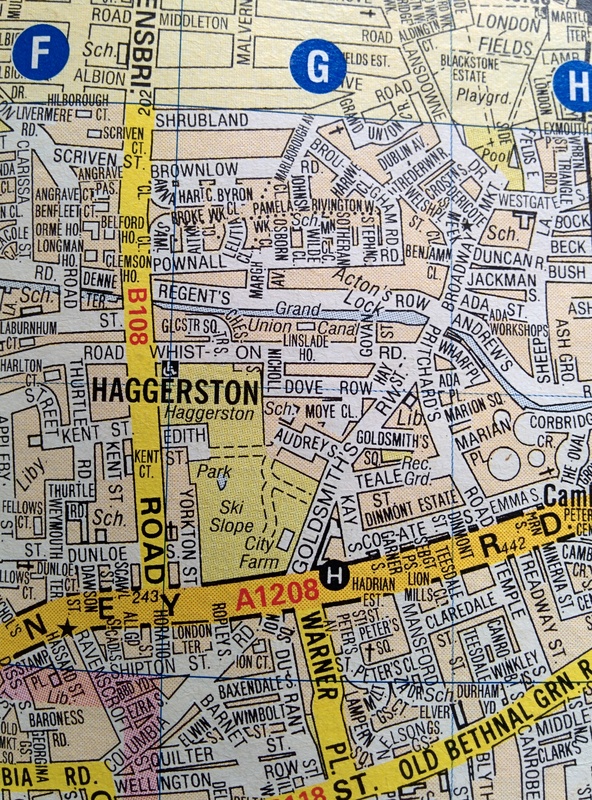 This entry was posted in Books, London, Maps, Secret London and tagged A-Z, deliberate mistakes, Haggerston, map, phantom, ski slope, trap street. Bookmark the permalink. Am doing The Knowledge. Don’t understand why Kimpton St (see on Google maps) in Camberwell is called Kimbolton St on the (larger scale) AtoZ. Maybe a diliberate mistake? Or just me? Awesome. I’m trying to put my finger on why this is awesome and I can’t. Mistakes? Awesome? Maybe it’s the treasure-hunt aspect of tracking down all the deliberate mistakes and, I don’t know, making some sort of otherwise insensible tour itinerary out of them. I’d heard that small streets were misspelt for copyright protection but hadn’t realised about phantom streets. I once came across one while trying to find a friend’s house & wondered what was going on. It’s one thing to confuse a few drivers, but re-naming Regent’s Canal as Grand Union, as on the map above, could leave boaters way off course.